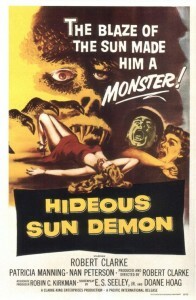 The late Robert Clarke appeared in a number of cult sci-fi classics including The Man From Planet X (1951) and Beyond the Time Barrier (1960), but the one he’ll be best remembered for is 1959’s THE HIDEOUS SUN DEMON, which Clarke also co-wrote and co-directed. I vividly recall watching this as a little kid and being freaked out by the scene where the monster squishes a mouse in his hand! I was also eternally marked by the sad, sultry, buxom barfly blonde (Patricia Manning) who befriends him. Clarke plays a poor sap who gets exposed to solar radiation (or something like that) and instead of turning into a monster by night, he is transformed into a scaly beast when exposed to the direct sunlight! This twist on the werewolf mythos works on every level: it’s sympathetic, scary and stylish, in a very low budget, charming way. Fans still lovingly note the fact that Clarke sweated so much in his iconic rubber monster suit, it looks like the Sun Demon got a little too excited running around causing mayhem. Throw in some gangsters and you got yourself a perfect little B movie masterpiece with all the key elements. Available on DVD. Tagged Hideous Sun Demon, Robert Clarke. Bookmark the permalink.